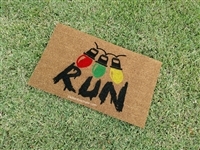 Feel free to scream out loud at any time by being a total fan and pay homage to your favorite character or story with one of our Fandom custom doormats. Better stuff the neighbors have, they do. Only a nickle? It's a bargain! How about a nice hot cup of trekkie earl grey? She's strange and unusual, therefore she attracted that crazy ghost, will you? Welcome to your Jurassic Home. You're a fan of the mother of all mothers. 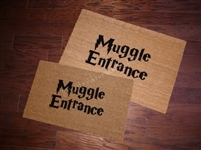 Also muggles enter here as well. Who loves pie? You do and so does Dean. It may not be the best day to try and take my throne. No funny business here, serious wizard business only. Beam me up, it's hot out here! Show off your fandom with a Sherlock Holmes custom doormat. Hey, did you bring the salt? Good, now make a circle with it. Our fandom Stranger (mat) Things says RUN! Listen if your lights start talking to you! The dark side is strong with you. The door you found, knock you must. Yes! The force of farts may turn you green. A zombie family. Way better than a stick figure family! You must be mistaken, this is not the door you're looking for. You must be mistaken, this is not the door you're looking for. Take 2.